Located in an elegant and private building, the apartment of Via del Bollo combines the modernity of prestigious furniture with the position in one of the historical streets of the city of Milan. Quiet and peaceful, in 50 square functional, the apartment is composed of a large kitchen with worktops, fridge, stove, coffee machine, round table and chairs of design. Very bright, with a private terrace furnished with tables and chairs and beautifully enhanced by views of the inner courtyard of the building; perfect for breakfast and small-scale aperitifs. It also comes with heating and air conditioning, Sky service, free WiFi internet connection. Sleeping area with king size bed (possibility to add a third bed) and large closet; wooden floors in the bathroom, which includes a large shower, sink and of prestige. The apartment is 5 minutes walking far from the Teatro alla Scala and five minutes from the Expo Gate 2015, various shops along Via Montenapoleone and is adjacent to restaurants and services of prestigious food for breakfast, lunch and high profile dinners. It's also closed to the main subway lines: the Red M1 (Duomo, Cordusio, Cairoli), M3 Yellow (Duomo), bus and tram lines. At the fifth floor of a noble and reserved context, finely furnished apartment set in Via delle Asole, in the heart of the city and a few steps by Duomo. In a limited traffic zone, the apartment opens on a bright kitchen with worktable equipped with fridge, burners, coffee machine. The sleeping area has a king size double bed. The entire space is cured in minimum details with parquet floors. The spacious bathroom includes a large bath tub, sink, and luxury bathroom fixture. Heating and air-conditioning, Sky service, Wi-Fi with free internet access are included. The apartment is 1 minute by foot fare from Duomo and 3 minutes from Teatro alla Scala. The area is full of shops, big museums of the city center, excellent culinary services between high profile breakfasts, lunches, and dinners. The central position allows to enjoy the many public transports reachable by foot such as metro M1 Red (Duomo), M3 Yellow (Duomo), tramways and bus lines. 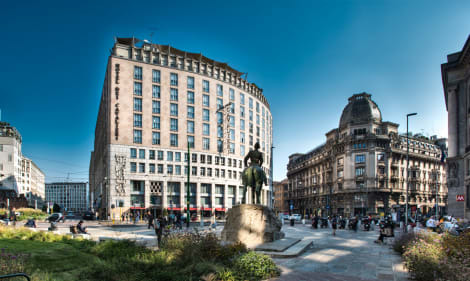 With a stay at Maison Milano UNA Esperienze, you'll be centrally located in Milan, within a 5-minute walk of Cathedral of Milan and Piazza del Duomo. 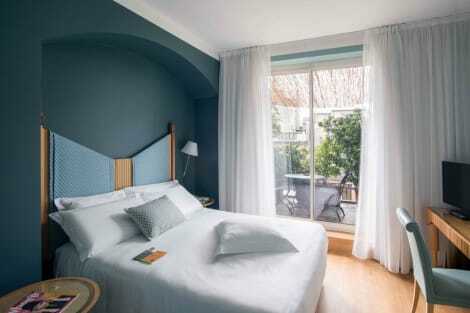 This 4-star hotel is 0.2 mi (0.3 km) from Galleria Vittorio Emanuele II and 0.4 mi (0.6 km) from Teatro alla Scala. 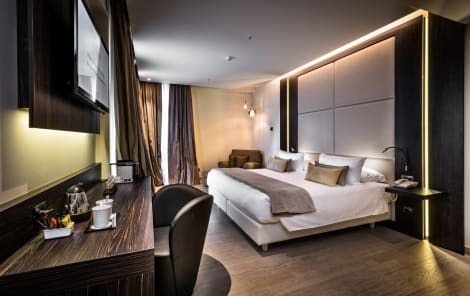 Ideally set in the heart of Milan within a stunning mid-20th-century building, the 4-star Hotel Dei Cavalieri is close to the city’s upmarket shops, the Royal Palace and restaurants and bars. Defined by elegant décor and comfortable touches, this hotel has an Italian restaurant, a trendy bar and café, and meeting and event facilities. Rooms have the same emphasis on cosy and modern features with sleek décor, free wi-fi, satellite TVs, air conditioning and a complimentary breakfast. Set in a historical building, The Square Milano Duomo is 350 metres from the Cathedral. It offers a restaurant, a bar and free WiFi access throughout. Each modern-style room here comes with air conditioning and a minibar. The private bathroom is complete with a hairdryer and free toiletries. The Square Milano is within a 15-minute walk of La Scala Theatre and Parco Sempione. Missori Metro stop is 100 metres away. Milan City Centre is highly rated by guests for: opera, warm weather, cocktails.